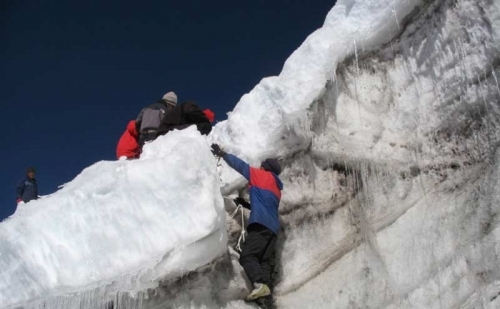 Yala Peak Climbing is popular climbing peak in Langtang region. 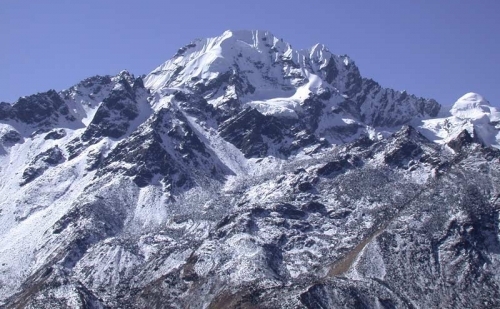 Yala Peak is one of Nepals easier trekking peaks, lies in the Langtang region, just north of Kathmandu. 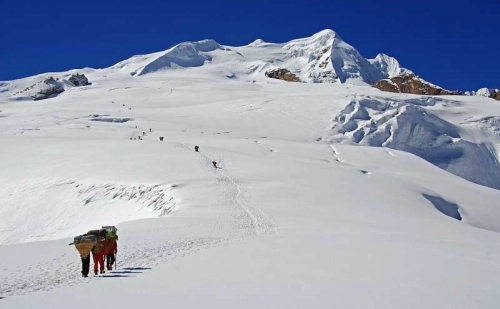 This 5500m peak requires no prior mountaineering experience though average level of fitness is recommended. 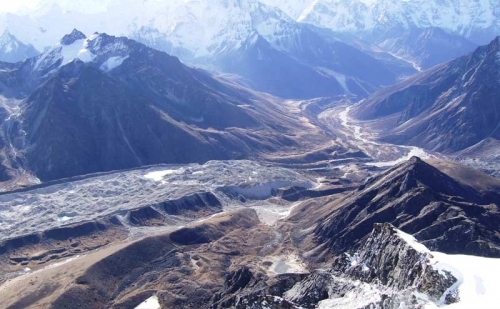 The trekking route through Langtang Valley is popular for scenic views of snowcapped peaks and beautiful glaciers. 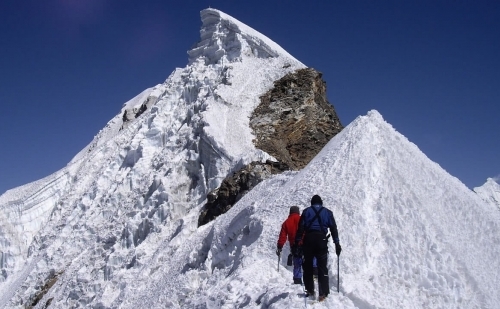 Gradual elevation during the trek acclimatizes the body and prepares for the peak climbing. Among the many options to get to Yala, we drive to Syabrubesi and begin the trek. Though rhododendron forests and lowland villages, we reach Lama Hotel where we stop for the night. The next day we move to Langtang Valley and stay at the village. From the village Kyanjin gompa is a short walk where we stop for acclimatization and also schedule a hike to Tsergo Ri (4985m) whith stunning views of the Langtang massif. We then move to the Yala Base Camp and stay overnight at in a tent. 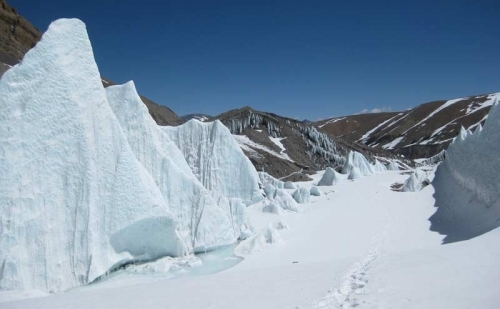 The next day, we scale the Yala Peak, which requires rope and ice axe as support towards the end of the climb and return back to Kyanjin Gompa. We return back through the Lama Hotel and head on through a small Sherpa village to Khanjim. From here we move to Syabrubesi and take a bus to Kathmandu the next day. Climbing Yala Peak along with Langtang Trek is an easy yet rewarding trip. 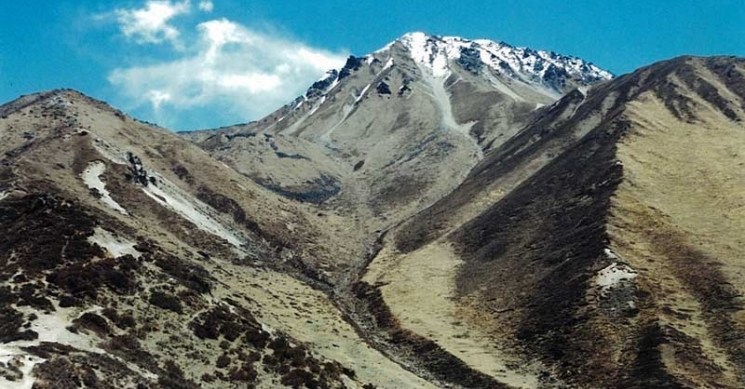 Langtang Valley Trek is a cultural trek which introduces to the Tibetan Buddhist culture. 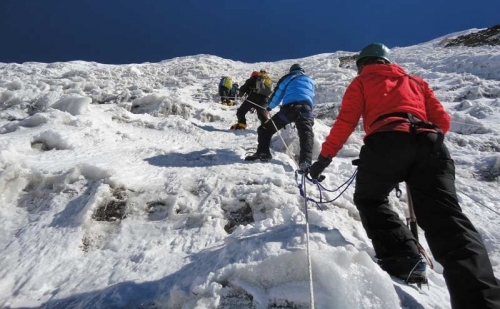 Yala Peak Climbing is an enthusiastic beginning and an introduction to climbing peaks for amateurs. 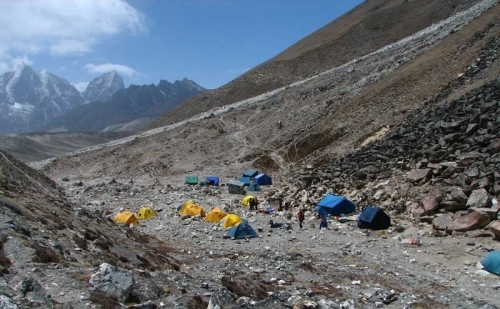 Day 8 :Trek from Kyanjin Gompa to Yala Base Camp 4600m/6hrs, Stay overnight at tented camp. Day 9 :Summit to Yala Peak 5500m and back to Kyanjin Gompa 3870m/8hrs, Stay overnight at hotel. Day 10 :Trek from Kyanjin Gompa to Lama Hotel 2470m/5hrs, Stay overnight at hotel. Day 11 :Trek from Lama Hotel to Khanjim 2235m/5hrs via Sherpa Gaon, Stay overnight at hotel. Day 12 :Trek from Khanjim to Syabrubesi 1467m/5hrs, Stay overnight at hotel. Day 13 :Drive from Syabrubesi to Kathmandu by bus and transfer to Hotel. Day 2 :Preparation day for climbing permit & briefingAfter breakfast, you will be introduced with the trek leader/guide at the hotel. This pre-trip meeting is for briefings on the trek and other necessary details. Please bring along your passport and three passport sized photos and a copy of your travel insurance policy. You can use your free time to rest or explore around for some last minute shopping. Day 8 :Trek from Kyanjin Gompa to Yala Base Camp 4600m/6hrs, Stay overnight at tented camp.Along the rocky glacier paths, the walk today takes us to Yala Base Camp. 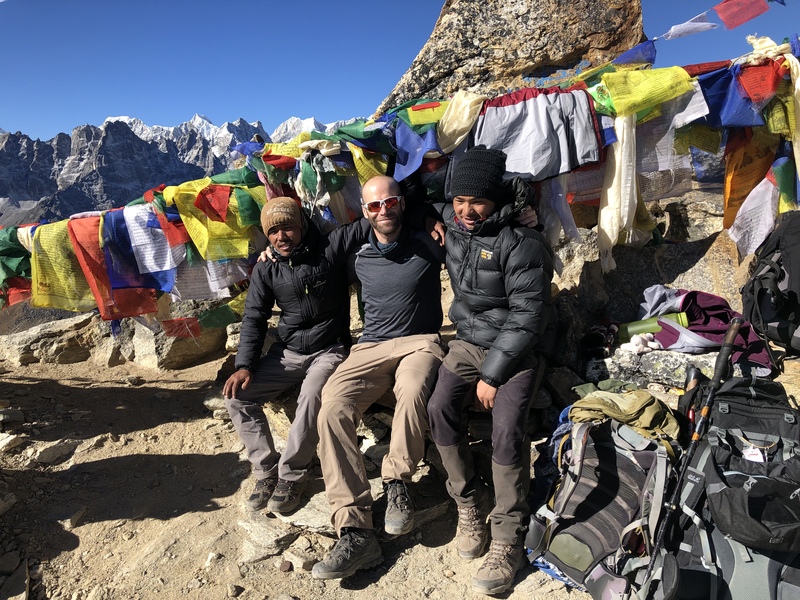 Though the walk is a cautionary and rather difficult, the base camp offers astounding views of many peaks including the Yala, Tserko Ri and Naya Kanga. At the base camp. We set our tents and prepare for the next day’s summit. The guides will brief you on the peak and its sections along with basic trainings on the use of climbing gears. Overnight stay in a camp. 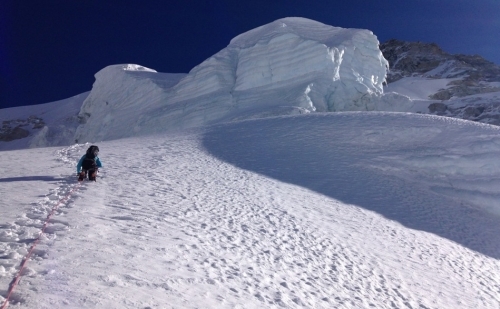 Day 9 :Summit to Yala Peak 5500m and back to Kyanjin Gompa 3870m/8hrs, Stay overnight at hotel. We start the climb early in the morning. The peak is not a very technical climb and can be easily accomplished by beginners. From the top, panoramic views of Dorje Lakpa, Naya Kanga, Tserko Ri, Langtang Lirung, among many others form a wonderful array. We head back to the base camp and descent all the way to Kyanjin Gompa where we stay overnight in a hotel. Day 10 :Trek from Kyanjin Gompa to Lama Hotel 2470m/5hrs, Stay overnight at hotel.We first descend to Kyanjin Gomp where we take our lunch, and descend further the same trail that we came from. The pleasant walk downhill through rhododendron forests leads to the Lama Hotel where we rest for the night. As we lose altitude, the air thickens up and eases our body functions. Overnight stay in a lodge. Day 11 :Trek from Lama Hotel to Khanjim 2235m/5hrs via Sherpa Gaon, Stay overnight at hotel. It’s a mostly downhill trail from Lama Hotel to Khanjim which takes around five hours of walking. The walk is easing as we are losing altitude. We pass through Sherpa Gaon where we take a rest and observe the local lifestyle before descending to Khanjim. Overnight stay in a hotel. Day 12 :Trek from Khanjim to Syabrubesi 1467m/5hrs, Stay overnight at hotel.Today we walk through rhododendron and bamboo forests while crossing a few rivers on suspension bridges. This is an easy walk and quite pleasant as well after the strenuous journey we accomplished. The day also marks the end of our trek. Overnight stay at the hotel. Day 13 :Drive from Syabrubesi to Kathmandu by bus and transfer to Hotel.It’s an early morning drive back to Kathmandu. The scenic drive also serves as a relaxation from the long walks. Back in Kathmandu, Green Valley Nepal Treks celebrates the successful accomplishment of the journey through a farewell dinner in a traditional Nepali restaurant. Overnight stay at a hotel. Day 14 :Final Departure or onward for your next programDeparture from Kathmandu. A drop from the hotel to the airport 3 hours before the scheduled time of flight is arranged in a private tourist vehicle. You can also opt for another package with us and move towards the next destination.